Qingdao is situated at the foot of Lao Shan Mountain and on the shore of the Yellow Sea. Its climate is pleasant and its scenic spots are very beautiful. Qingdao is a famous garden city in China and its coast has many lovely inlets. Qingdao&apos;s architecture presents a characteristic European style and is very harmonious on the whole. Red roof tiles, green trees, azure seas and blue skies mirror the beautiful manner of Qingdao. Its crimson reefs, gentle waves, colorful sailing boats and golden beaches help to make up the beautiful scenery. Qingdao&apos;s history, religion, natural conditions, native customs and its festivals constitute the city&apos;s tourism culture. There are also some old buildings where famous figures in China&apos;s modern history once lived. The city&apos;s construction on the whole is a combination of European and traditional Chinese styles. 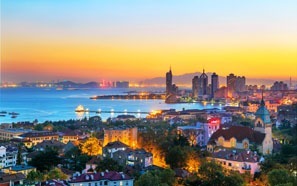 Qingdao has two nicknames: "Oriental Switzerland" and "Asian Geneva". Qingdao, like a Shandong girl, is open and frank. The air is very clean in the city and the streets are very clean too. Houses along both sides of the street look bright against the background of the total clearness of the city. A person will feel very comfortable when leisurely walking along the streets of Qingdao. Western Qingdao presents a classical beauty. However, the eastern part of the city has a modern charm, even a super-modern charm. The sea gives the city a sense of openness and Lao Shan Mountain brings a feeling of quietness and secluded beauty. There are only a few holiday resorts in China where there is a combination of quietness and activity such as in Qingdao. 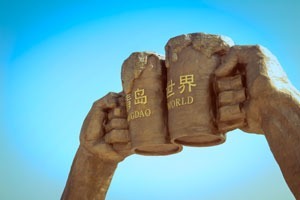 The Qingdao Beer Festival and Qingdao Sea festival are held regularly every July or August. Related colorful activities are included in the festivals, which tourists are welcome to take part in. Meanwhile, slim Qingdao girls and generous Qingdao boys are attracting tourists to pay attention to the charming characteristics of the native people. Qingdao specializes in seafood. It is mild in taste, which is very welcome. The green stone of Lao Shan Mountain, natural pearls and ingenious craftwork made of grass are tourists&apos; favorite buys. Qingdao is also famous for its beer. You can taste and enjoy the true original Qingdao beer here. The area of Qingdao city is 10,654 square kilometers, among of which the area of downtown is 1,202 square kilometers. The population of the city is 2.24million. Address: 59 Xianggang Middle Rd. Address: 56 Xianggang Central Rd. Address: 67 XiangGang Middle Rd. It is very convenient for tourists to use credit cards in star hotels and the large emporiums of Qingdao. At present main credit cards accepted in China, are Master card, Visa, American Express, JCB and Diners.